Fish South Florida with Captain Harold! Captain Harold is a hands-on Captain who knows all the local Fort Lauderdale charters hot spots including the best places for Fort Lauderdale deep sea fishing. 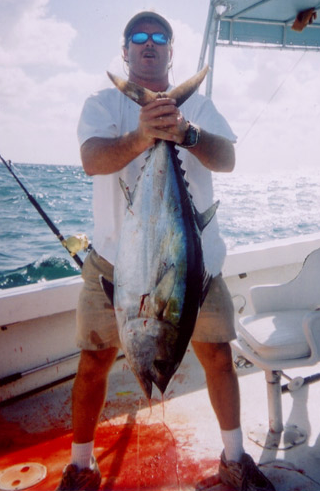 He has his own successful deep sea fishing charters, and guides hundreds of clients straight to the top producing Fort Lauderdale deep sea fishing holes in the Atlantic all around Fort Lauderdale, FL and the Bahaman Islands. He knows expert techniques unlike any other Fort Lauderdale deep sea guides offering deep sea [Captain Harold Heuff] charters in Fort Lauderdale, so you'll be sure to catch the fish in Florida. 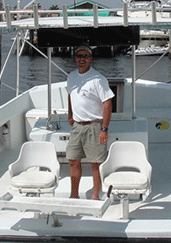 With his background in building boats and his 100 ton Captain's Florida deep sea fishing guides license, Captain Harold is able to keep the "Happy Snapper" and the "Happy Snapper Too" in top fishing shape for all Fort Lauderdale deep sea charters and guides. This allows him to focus on making sure that your time spent enjoying Fort Lauderdale deep sea fishing will be an exciting productive sport offshore fishing experience in every way. Using well-maintained Penn ad Shimano tournament deep sea fishing rods and reels, and light tackle capable of landing the biggest Fort Lauderdale deep sea catches, Captain Harold has tagged, released and logged hundreds of sailfish in and around Fort Lauderdale in South Florida. If you're looking for the BEST Fort Lauderdale deep sea fishing charters and guides in all of Fort Lauderdale call Captain Harold today!